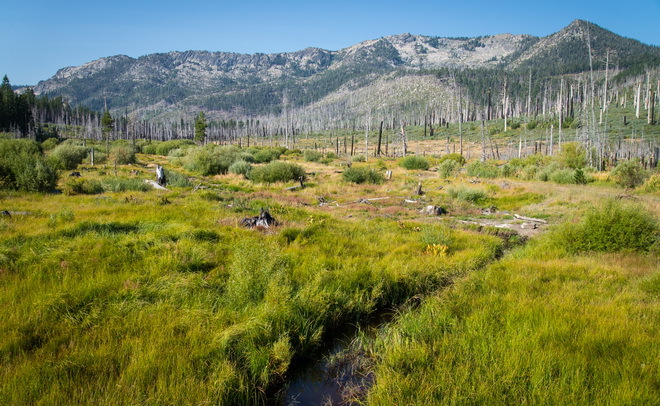 Stream Environment Zone (SEZ) is a term unique to the Tahoe Basin and encompasses more than just wetlands. SEZ was developed by TRPA to denote perennial, intermittent and ephemeral streams and drainages, as well as marshes and meadows, and they generally possess the following characteristics: riparian or hydric (wet site) vegetation; alluvial, hydric soils; and the presence of surface water or near-surface groundwater at least part of the year. Within the Basin, is has been determined that the development and human activity that has occurred has reduced marshes by 75%, meadows by 50% and riparian areas by 53%. While SEZs may only make up 5% of the land area in the Basin, they provide key habitat for 84% of the 250 wildlife species in the Basin and can help to reduce sediment and nutrient runoff concentrations by 70-90%. In addition to these enormous resource benefits, SEZs can also provide dispersed recreation opportunities, scenic open space, flood flow capacity, and buffers within urban areas. Given these multiple resource benefits that SEZs provide, the Conservancy finds it essential that we look to preserve and restore them. The Conservancy’s SEZ program was established to restore and enhance important SEZ and watershed areas by working to generate projects that include multiple resource benefits like water quality improvement, soil erosion control, wildlife and fisheries habitat, vegetation enhancement, scenic resource enhancement, public access, and interpretive opportunities. This is accomplished through direct project implementation as well as through grants to partner agencies. Project activities include removing fill, restoring natural, historical stream channels, stabilizing and revegetating stream channels, reconnecting floodplains, as well as acquiring SEZ properties and removing structures and buildings within them. Projects are developed using a Technical Advisory Committee, made up of representatives from partner agencies like TRPA, Lahontan Water Board, etc. to assist in evaluating alternatives and restoration strategies.